NORTH ATTLEBORO, Mass. – After a slow start to the game, North Attleboro put the ball in the hands of senior quarterback Chad Peterson and the Amherst College-commit came through with four touchdowns, two through the air in the first half and two more on the ground in the second, to lead the Rocketeers to a 28-14 first round win against Walpole. North was able to survive and advance, despite the defense allowing more than 200 passing yards against Walpole’s spread formation, including 163 receiving yards (on 11 receptions) by wideout Chase Conrad. 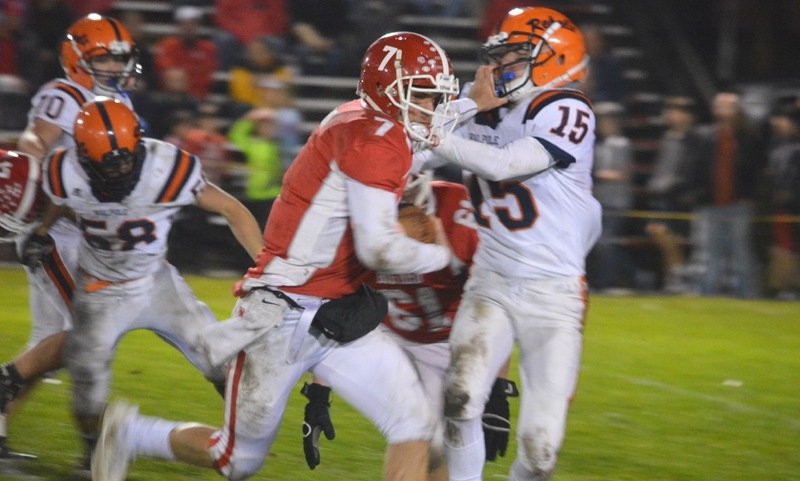 The North defense showed its ability to get pressure straight up the middle on the first Walpole series when Ryan Clemente dislodged the ball from Rebels running back Drew Van klock, hitting him just as he received the ball. North returned the favor with a fumble five plays later but again the defense kept the pressure up on Walpole senior quarterback Brett Lavanchy (17-32, 223 yards). Geoff Wilson, Sam Bullock, and Zach DeMattio all forced Lavanchy into rushed throws and Wilson’s sack led to a Rebels punt. North took over on its own 15-yard-line and proceeded to put together a 12-play, 85-yard drive to open the scoring. Nathan Pearce (11 carries, 96 yards) got the drive going with a 28-yard jet sweep to the far sideline and North kept advancing into the red zone until Peterson was sacked to force a third and 18. Peterson hit Pearce on an eight-yard screen and, on fourth and 10, found Ryan Gaumond on the near sideline for 16 and a first down. Two plays later, Peterson bought time and found Nolan Buckley open in the back of the end zone for an eight-yard touchdown. Walpole responded quickly. Conrad returned the kick to the Walpole 45 and it took the Rebels only six plays to get on the board. DeMattio and Adam Eberle combined on a sack to force third and 13 from the North 47, but Walpole caught the Rocketeers in an all-out blitz. Lavanchy’s screen pass found Conrad in space and he took it the distance. A missed extra point kept North in the lead, but the Rocketeers failed to take advantage on the next drive, turning it over on downs at the Walpole 16. Jonathan James and Bullock combined on a sack to end Walpole’s drive and get the ball back for North with just 51 seconds remaining in the half. The Rocketeers took over at the 50 and Peterson proceeded to march the hosts down field, needing just five plays to add a big score before the break. All three completions on the drive went to Devin Slaney, including the 26-yard touchdown. The Rocketeers got the ball back to start the third quarter and promptly extended the lead. Pearce broke a 31-yard run to get the ball into Walpole territory. Peterson would take it the final 16 yards on a pair of carries to make it 21-6. Walpole’s ability to move the ball through the air meant that the game was far from over and the Rebels immediately responded to cut the lead back to one score. Conrad had another big return to get the ball near midfield. A 26-yard catch moved the drive inside the North 30 and then it was finished with a 16-yard catch in the back corner. Lavanchy and Conrad connected on the conversion as well. After a North punt, the Rebels were on the move again, getting the ball inside the Rocketeers’ 10. Lavanchy was forced to throw a pass away on first and goal then was stuffed for a four-yard loss on a keeper by Jason McNeany and Marc Burns. 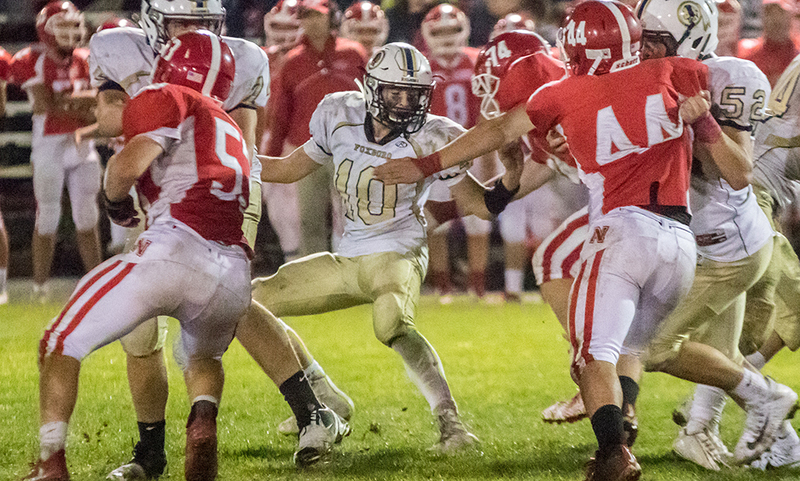 On third and goal, Clemente got loose in the backfield for North’s fifth sack of the game. With Gaumond in coverage, the fourth down pass went out the back of the end zone. North took over on its own 17. The Rocketeers put together a 13-play, 83-yard drive that put the game away. While the bulk of the drive consisted of runs by Peterson (13 carries, 88 yards), Pearce, and Nick Raneri (13 carries, 54 yards), there were also two big completions from Peterson to Gaumond on the far sideline. Peterson capped the possession with a seven-yard keeper to seal the win. 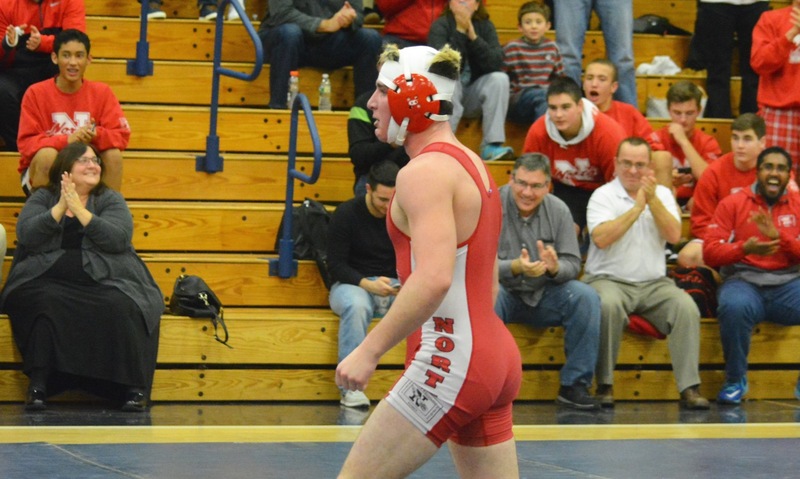 North Attleboro (7-1), the top seed in Div. 3 South, will host the Black Knights (6-2) on Friday night at Community Field. NORTH ATTLEBORO, Mass. – It should be no surprise that a battle between two of the top teams in the Hockomock League came down to just a handful of big plays. North Attleboro ended up on the fortunate side of the final big play, holding on for a close 14-13 win over visiting Foxboro to take sole place of the Davenport division with two games to play. It looked as though the Rocketeers had a chance to finish the game when Mario Bresko came up with an interception with 2:57 to play and a seven point lead. But Foxboro’s no-quit attitude helped the Warriors force a quick three and out and get the ball back with 2:20 to play. Starting at the North Attleboro 35-yard line, Foxboro quickly moved into the red zone. 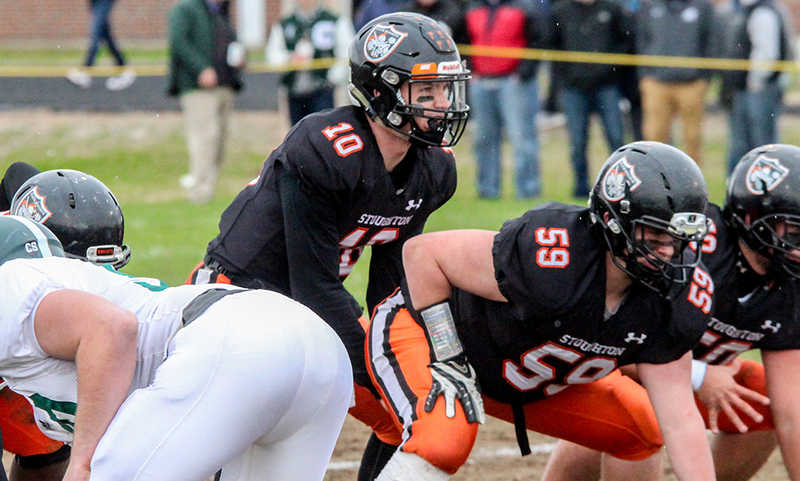 A pass from Devin Hassett (9/17, 88 yards, two touchdowns) to Jack O’Donnell and a QB keeper moved the chains. Hassett found O’Donnell for 10-yards and then Anthony Capachietti (14 carries, 65 yards) moved the chains again with a seven-yard burst. Facing third and goal from the five, the snap was bobbled and North Attleboro’s Sam Bullock and Geoff Wilson swarmed for an eight-yard sack. The Warriors had just one play left – 4th and goal from the 13-yard line – with 18 seconds to play. Hassett fired over the middle, connecting with O’Donnell on the slant. It looked as though North had him stopped just before the goal line, but the senior dove forward, stretching out the ball across the goal line for a touchdown to make it 14-13 with 0:10 to play. However, Foxboro’s connection between snap and hold was just off, forcing the extra point kick to be low and into the line, giving the Rocketeers a one-point win. 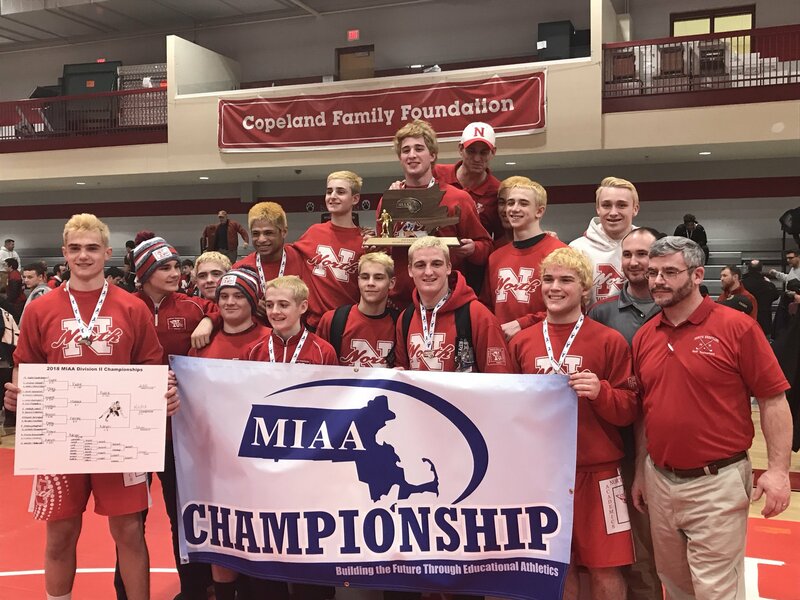 “I’m really proud of the effort of the kids,” said North Attleboro head coach Don Johnson. “We hung tough and made some plays. But I’m not sure if I’m ready to call us good yet, that was your word. Foxboro was a good team though, I know that. North Attleboro took the lead on the possession prior to Bresko’s interception. It was the second time that the Rocketeers ran 10-plays in a series (the other time was in the second quarter that also resulted in a touchdown). This series was the longest drive of the game for Big Red, spanning 73-yards. It looked as though the drive was going to stall early when Foxboro’s Martin McElroy blew up a second down run. Facing 3rd and 13 from their own 24-yard line, North quarterback Chad Peterson (9/11, 110 yards, two touchdowns) was flanked out to the right and hit Brendan McHugh (16 carries, 54 yards, four receptions, 76 yards) right at the first down marker to move the chains. McHugh then rattled off runs of seven, four and nine yards before Nick Raneri (11 carries, 36 yards) moved the chains with a three-yard burst up the middle. Three plays later, North was faced with 3rd and six at the 36-yard line. Peterson dropped back to pass, firing to his left as McHugh came towards him. Nolan Buckley, who was lined up in the slot, turned out wide to start and then came up with a perfectly timed block when McHugh hauled in the pass. The junior was able to break a tackle up field and scampered his way for a 36-yard score. Wilson’s extra point made it 14-7 with 4:43 to play. Foxboro had a strong start to the game. They forced a turnover on downs when North Attleboro’s fake punt from its own 40-yard line fell incomplete. Seven plays later, the Warriors were in the end zone when Hassett hit Jake Addeche (four receptions, 35 yards) on a seam route up the middle for a 14-yard touchdown and a 7-0 lead. North Attleboro tied the game on its first drive of the second quarter. The drive spanned 61 yards on 10 plays, with the Rocketeers getting into the end zone with less than a minute to play in the first half. On second and goal from the seven, Peterson hit Raneri out of the backfield and he muscled his way into the end zone to make it 7-7. Big Red’s defense was at its best in the second and third quarters, forcing Foxboro to punt on all four of its drives in those two quarters. Foxboro had moved towards the red zone but on second down, Zach DeMattio and Jason McNeany forced a 10-yard loss on a sack and the Warriors had to punt two downs later. In an early drive in the fourth quarter, Foxboro had a second down at the North 30-yard line, but Bullock’s sack dropped the Warriors back 15-yards. Pressure from Adam Eberle and Wilson on third down forced an incompletion and Foxboro once again had to punt. North also had an early third quarter drive stalled when Addeche and Louis Piccolo forced a fumble after a completion. Big Red had to punt on its next drive as well after getting just two yards in three plays. North Attleboro football (4-1 overall, 3-0 Davenport) now moves into a position to clinch a league share with a win next week when it travels to Stonehill College to take on Stoughton. The Rocketeers have a chance to clinch a share of their third straight league title. The last time North Attleboro did that was 1997-1999. “We made a reference that a win tonight would put us in the position to be playing for a share of a championship. Foxboro (3-2, 2-1) will look to bounce back when it hits the road to take on Milford next Friday.